Of course, a powerful computer also needs a monitor as strong. Otherwise, high-resolution content may be not displayed in the expected quality on the screen, even though the computer reproduces it correctly. So you need a good monitor. However, there are huge differences in the size, resolution, format, and features of each monitor. So that you do not lose track of the search for a suitable monitor, we compared a total of 11 different devices for you, taking into account the most important features. Read the following Monitor Guide to see how the different technologies work and what to watch out for when you want to purchase a new monitor. What are different types of monitors there anyway? Is there a monitor test of a well-known trade journal? Monitors are the visual output device of computers. This pictures, games, texts, and movies are displayed correctly and in fine gradations. In our rapid age of information, the monitor can look back on a comparatively long history. Despite all the possible alternatives, such as laptops, tablets or smartphones, which use a built-in screen, both in private and in the professional field, the output of images on an external screen is favored. If you want to enjoy your new monitor for as long as possible, you should pay a lot of attention. In our guide on GameToAid, we would like to give you a basic overview of what to pay attention to when buying a monitor. The display or screen of the monitor is the irreplaceable output device of any computer. It visualizes all data created by the computer and the graphics card. The flat-panel monitors of today are equipped with LCD screens. The LCD monitors have completely replaced the grossly sluggish tube monitors in everyday life. A newer technology for these flat screens is OLED displays. Especially with smartphones and televisions from the higher price categories, OLED displays are used instead of LCDs. The OLED displays shine with their high contrasts and rich black levels. Meanwhile, the first monitors with OLED displays are available on the market. However, these devices are much higher in price than comparable LCD monitors. The resolution of the monitor refers to the number of pixels available. The more such pixels or pixels are used to assemble a picture, the better and more detailed the picture is. To determine the resolution, multiply the number of horizontal lines by the number of columns. Thus, a monitor that has a resolution of 1920 x 1080 pixels has exactly 2,073,600 pixels or pixels. The majority of the market is occupied by the monitors with a resolution of 1920 x 1080 pixels. With this resolution Full HD is achieved, as it is also supplied by Blueray players. Thus, you can on monitors that have such a resolution, enjoy HD movies in full quality. The 3840 x 2160 resolution Ultra HD monitors provide excellent detail reproduction, making them highly sought after by graphic artists, gamers and movie fans alike. 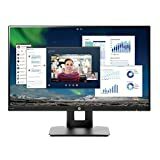 Someone who needs a monitor for their home office and needs enough space for different programs often chooses a screen with a resolution of 2560 x 1440 pixels. Unlike a screen with 3840 x 2160 pixels, the font and icons here remain in an eye-friendly size. Someone who gets a small, cost-effective monitor for rare office work can settle for a screen size of 19 inches and a screen diagonal of about 48 centimeters. However, a majority of buyers choose a monitor with a size of 22 to 24 inches (screen diagonal 56 or 61 centimeters). More and more market volumes are taking over monitors with a diagonal of 26 to 27 inches or 66 to 69 centimeters screen diagonal. Of course, the super wide 34 inch monitors are particularly spectacular. These widescreen displays are also very practical. With 86 centimeters screen diagonal is enough space for working, watching movies or playing games. Computer screens come in a sheer infinite number of variations and sizes. Many monitors were designed primarily for the office environment and offer a screen resolution of 1280 x 1024 pixels and an aspect ratio of 5: 4. With the almost square measures, even longer office documents can be displayed without the user having to scroll down. When the Internet was still in its infancy, 17 inch CRT monitors with a resolution of 1024 x 768 pixels were still standard. At that time, many web designers optimized their internet pages to this so-called XGA resolution. Today, the HD monitor with a resolution of 1920 x 1080 pixels is the standard. Monitors with this resolution are extremely versatile. With such a monitor, all normal programs can be used. At the same time, he presents photos and films in HD quality. The differences in technology are largely due to how the liquid crystals are arranged. The TN panel is characterized, for example, for its fast response time, but offers in comparison with the IPS panel slightly lower image quality. But because the difference is only in the microsecond range and is hardly noticeable, choose PC players, for which it is particularly important for every ever so short moment, due to the better quality of the image now often an IPS panel. The IPS panel offers the best picture quality with strong contrasts and clear color reproduction. Monitors that use an IPS panel can be viewed from any angle without loss of contrast or color saturation. Most high-quality monitors, therefore, have an IPS panel. The VA panel can also convince with a good image quality, which is only slightly inferior to the quality of the IPS panel. However, they are considered to be a bit slower in the image structure. With the development of overdrive technology, this negative point has been reduced. The differences in the quality of the IPS panel are barely there. Attention: You should know that! 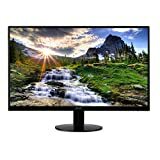 Before you buy a new monitor, you should consider which tasks the computer has to do most often and which activities are most important. If you do this, you can avoid buying a monitor that is “overqualified” for its intended purpose and saves you money. The first decision you have to make when you think about the size of the desired PC monitor. For the home office area, numerous computer screens can do their job well. The correct size of the filter depends on many different factors. So you should ideally sit about 1.6 times the screen diagonal away from the monitor. For example, if you have a PC monitor with a 24-inch screen, you will need a seat pitch of just under 97 centimeters, and a 27-inch PC monitor will require a 110-inch seat pitch. Even if you only work with programs for editing texts or spreadsheets and occasionally surf the Internet, you should think twice about deciding whether to opt for a larger monitor. Because the bigger your user interface is, the more different programs, you can open and use at the same time. This, of course, spares both your time and your nerves. A monitor with this aspect ratio provides a high level of productivity in the office environment. Also, if you research on the Internet, the almost square format brings advantages, because at a glance you can see a lot of information. If there is enough space on your desk, you may also want a monitor with an aspect ratio of 21: 9. Not only PC gamers and movie lovers will benefit from this type of monitor, but even with the use of complex programs, this aspect ratio can provide substantial relief. If you want to watch movies, videos and TV shows in HD, you should make sure that the monitor has at least a resolution of 1920 x 1080 pixels. This resolution has long proven itself and corresponds to the Full HD format. If you value the image quality and work with image editing programs on a regular basis, you should choose a screen with an IPS panel. The type of LCD technology provides the best reproduction of images and allows images and videos to be displayed with natural contrasts and colors. Because today all flat screens are illuminated by LEDs, large differences in quality are a thing of the past. Nevertheless, there are still monitors that suffer from a patchy illumination of the image and thus can not meet high standards. Therefore, a detailed monitor comparison, which draws your attention to such small quirks, of course, very helpful for your purchase decision. But we will go back to that later. Unfortunately, screens have not yet been able to establish a uniform connection type. Therefore, you should check before purchasing, what kind of connection your PC or laptop has. Although it is often possible to purchase adapters that make different connections compatible, a possible loss of quality can not be completely ruled out. The VGA connection is now considered outdated for a long time, as it still sends an analog signal, which must first be converted from the screen to a digital signal. The majority of popular PC monitors offer multiple ports at the same time. The majority of the cheap screens are still installed VGA ports because they usually turn out small and the quality loss due to the signal conversion is rather low. If you are looking for a second monitor, you can opt for a USB monitor. Since the USB card simulates the graphics card, you can also easily connect a second monitor to your computer without the need for a second graphics card. If your monitor needs maximum detail, you should choose an Ultra HD monitor with a resolution of 3840 x 2160 or 8,294,400 pixels. However, these monitors have a corresponding footprint. They are also ideal for anyone who attaches great importance to excellent graphics and deals a lot with image editing. For PC players, an Ultra HD monitor is also suitable. Above all, this is an investment in the future, since games on the PC are nowadays mostly still running in HD. Of course, there is not always enough room on a desk for a large monitor. As an alternative, a monitor mount or a swivel arm for the wall offers. If you are interested in this option, be sure to check that the VESA standard is supported by the monitor before purchasing a particular screen. Also in our comparison, you will find such models. If you want to use the new monitor to watch movies, but you do not want to use external speakers or a headset, make sure that the screen of your choice has built-in speakers. If you use a tv monitor with built-in tuners, you can also boost your television enjoyment. Could you still choose a suitable monitor? Maybe then helps a comprehensive monitor test, for example, from the well-known journal “Computer Image”. In October, she did a monitor test with a total of 27 different products and arranged the monitors clearly in a leaderboard for you.